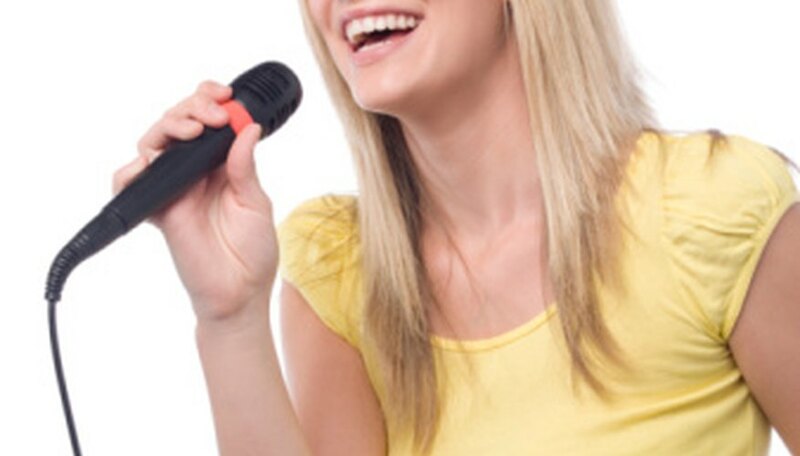 A singing contest is one way to draw people to your fundraiser, bar, church picnic or other social function. You could just stick to a basic karaoke contest, but there are many singing shows on television that can lend ideas. Just ensure you have the rights to publicly perform selected music, and that you do not infringe on TV shows' trademarks or copyrights. In addition, select gift certificates or find sponsors that will provide free prizes for contest winners. One of the simplest ways to hold a singing competition at your function is to set up a karaoke machine and let the people put on a show. Anyone wishing to participate in the contest can sign up and pick out a song from the karaoke playlist. When it is the performer's turn, the words to his song will appear on a monitor and the singer can belt out the tune. In karaoke, the performance usually is just as important as the singing. Have the audience applaud for their favorite act, and use a decibel meter -- or, for low-budget productions, an ear -- to determine who wins. Using your own three-member judging panel -- like on the TV show "American Idol" -- find the next "Idol" in your town or school. Before the live event, judges can hold auditions if they want to select the best acts. Each performer will take to the stage and sing the song of her choice. After the performance, the judges can provide feedback. After all of the artists have performed, the audience can vote on who they think is the winner. If the audience is not able to select a winner, the judges can be brought together to deliberate and select a winner. "The Voice" is a television show in which contestants audition in front of a panel of judges who have their backs to the singers. If you want to cast looks aside and have a singing competition based completely on talent, you could adopt a format based on this concept. Have each performer sing to a panel of judges who have their backs turned away from the stage. Instead of following the show format and having the judges create teams that compete against each other, judges can rate each performance on a scale from one to 100. The contestant with the highest score will be awarded the distinction of having the best voice. The "Singing Bee" on TV challenges its contestants to remember the lyrics to popular songs. Create your own similar contest. Have each contestant sing along with the words on a karaoke prompter, and then suddenly pause the music. If the contestant can recite the next line or two of the song, he advances in the competition; otherwise, he is eliminated. The last player left standing wins. Alternatively, you could assign each song a point value, and players can earn more points by correctly guessing difficult songs.